Get it for FREE! Dentists and Dental School students only. In a Dental Practice purchase, who is looking out for the buyer? There are very few resources out there these days for dentists looking to purchase a dental practice. This guide is designed to give you the information that you need to ask the right questions and make a good decisions for your own future success. What should the financials look like? Are you paying for dentistry that has already been done or for future revenue streams? 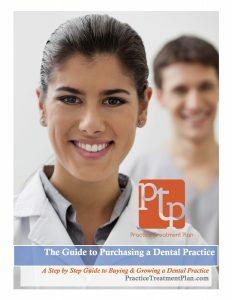 The Guide to Purchasing a Dental Practice is a collaborative effort from Practice Treatment Plan Dental Marketing and ddsmatch.com. There is one simple truth that all doctors face when becoming a practice owner for the first time: You don’t know what you don’t know. There are many areas where you will need guidance from professionals who have helped others before you. Request the Guide to Purchasing a Dental Practice TODAY! Just click on the button below to purchase online.